The Association has available for loan, a mobile bell, which can be used to demonstrate and promote bell ringing to a wider audience at such events as Church and village fêtes and fairs, tower training events and open days. When set up, the tower is twelve feet high; the fibre glass bell handles like a light tower bell with the sound being produced by a computer simulator which requires normal mains electrical power. The bell comes on its own trailer and can be towed by any vehicle capable of pulling a caravan. When folded, the trailer will fit into a normal garage for overnight storage. A fitted cover is provided, to protect the mobile bell when in transit or if it has to be left on a driveway overnight. 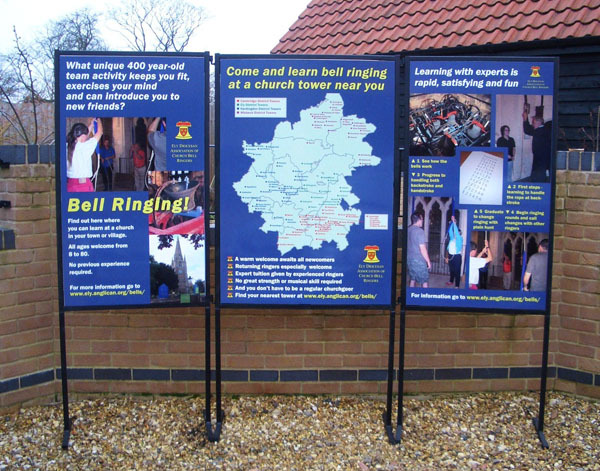 The Association's display stand, to be used in conjunction with the Mobile Demonstration Bell, has recently been refurbished with all-new weatherproof graphics panels designed to aid recruitment. Comprising three sections, the new display sets out the benefits for prospective learners, shows them where they can go to learn to ring, and clearly depicts the key stages of development. In addition, new matching A4 colour leaflets are available which can be overprinted on the reverse with District or local teaching tower details and folded to A5. 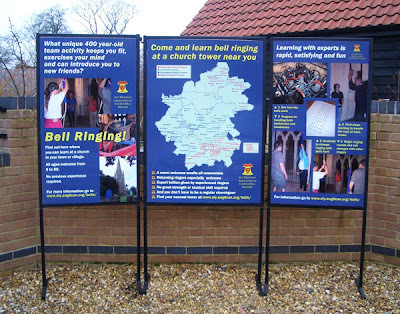 This 2.5 metre PVC banner is available for any tower that needs to advertise an open day or similar ringing-related event. The only proviso is that you hold it on a Saturday and have at least some of the attractions listed under the title, temporarily blanking out what is not on offer. If you are organising an open day at your tower or having a presence at local fetes or other events, the Association Mobile Demonstration Bell, Display Stand, Hand-out Leaflets and Advertising Banner are excellent ways of attracting attention and making people more aware of ringing and its benefits. Details of booking any or all of these valuable recruitment aids are here.